This meal is *vegan* and so ridiculously easy to make!! Which makes enjoying it all that much easier! I was a little hesitant when I made Zucchini Lasagna -- so was my boyfriend even though I had nothing but rave reviews about it!! 3 medium Zucchini, made into pasta! Add lentils and 1 cup of water to a small or medium pot. Bring to a boil and then lower to a simmer and cook until lentils are tender and liquid is evaporated, about 20-30 minutes. Meanwhile, add 1/2 tablespoon olive oil to a pan over medium heat. Add the onion and saute for 5 minutes, or until translucent. Add the garlic cloves and saute for an additional minute, until fragrant. Add the tomato sauce, basil, oregano, thyme, and salt and pepper to taste. Simmer on low for 20 minutes. When lentils are done cooking, add them to the sauce and simmer for an additional 10 minutes. In a separate pan, add the remaining tablespoon of olive oil and saute the zucchini pasta for 5 - 10 minutes, until desired tenderness is achieved. Divide the pasta among two plates and top with lentil marinara. Serve hot!! Fresh zucchini will often lose moisture as the zucchini pasta cooks - so be sure to drain any liquid that has built up in the pan. 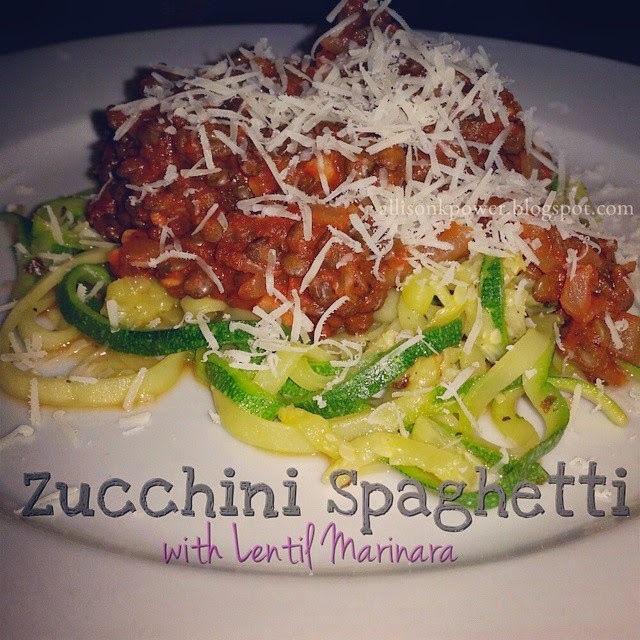 The recipe holds well as leftovers, but the zucchini does tend to release extra moisture as it sits so be sure to drain pasta before serving. If you enjoy my recipes and want to see more, or are interest in starting your journey to a happy, healthy & clean lifestyle ADD ME ON FACEBOOK! Or you can click HERE and I can start coaching you for FREE today! !